Beautiful cupcake decorations can make a simple sweet creation a work of art that your guests will cherish. Flavored frosted cupcakes are gorgeous, tasty and trendy items that many brides bake themselves. A cupcake is a treat for the eyes, and they have been used at sweet tables, as wedding favors and even replacing the traditional wedding cake. Presenting them in the right way can help you take these sweet creations to the next level. 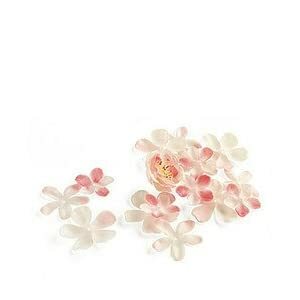 Here are our picks for cupcake decorations at a cherry blossom theme wedding. 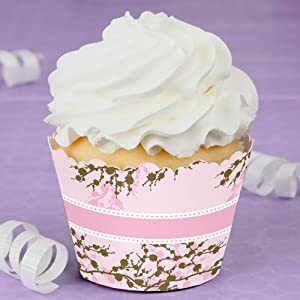 Dress up your cupcakes in style with these beautifully designed wrappers. In light blue with a brown cherry blossom branch design and small birds this delicate wrapper takes couture to your wedding sweets. 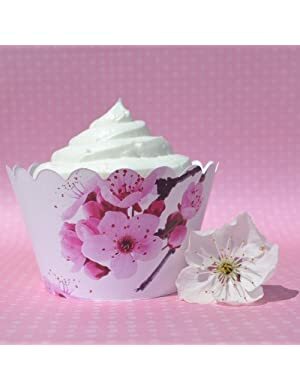 This cupcake wrapper has a bold pink cherry blossom picture design over a white background, making it ideal to fit any wedding color palette.